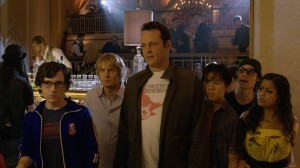 Much like ‘The Wedding Crashers‘, there is big potential for a successful comedy and tons of gut busting laughs from Vince Vaughn and Owen Wilson. And just like last time the two were together, we get a bland paint-by-the-numbers comedy that provides only a couple of laughs that is predictable and lacks any real entertainment that lasts more than a couple of seconds. 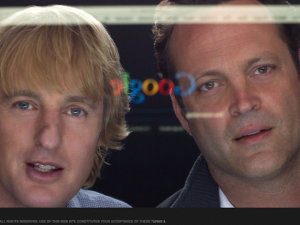 Not making the situation any better, this comedy has a PG-13 rating in order to bring a broader and family friendlier audience to the mix, and the entire movie feels like an ode to Google, more than a comedy. That being said, Vaughn and Wilson should still draw a decent opening weekend. Wilson and Vaughn play virtually the same characters they do in a every movie and here, even seem to be the exact same character with no differentiating characteristics. 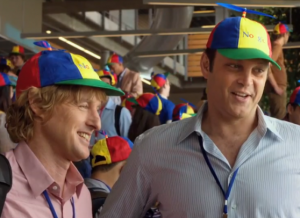 Billy (Vaughn) and Nick (Wilson) have been salesmen all of their lives, selling watches, scooters, and mattresses to name a few. But when their boss (John Goodman) informs them that their high-end watches they are selling are being phased out due to new technology and more people using their smart phones to check the time, the two are fired and are referred to as dinosaurs in a quick changing technological universe. For no reason whatsoever, the two apply to be an intern at Google, which might lead to permanent job at the mega corporation. In an awkward but sincere interview, the two land an internship for the summer at Google’s campus, despite their lack of knowledge in anything that has to do with a computer. They clearly are the oldest people in the room by over two decades and they are hoping that with the younger generation’s tech savvy education and skills, and their old school abilities to sell and lead, just maybe they have a chance to start over late in life. Even though the odds are against these two from the start, it’s unbelievable predictability will instantly tell you how this will end. All of the interns are divided into groups for the summer to learn and compete in challenges ranging from tech support, creating an app, and even a quidditch match to which the deciding factor on who gets the Google jobs are based on who wins the challenges. Nick and Billy are paired up with a few other young adults, all of which are very smart and are at the top of their classes in school, but all lack social skills. Much like Nick and Billy’s characters, these new partners are one note as well. I hoped for deeper characters here as well as roles that didn’t seem to be redundant. The band of misfits that form the team are Stuart (Dylan O’Brien), the above it all hipster, Yo-Yo Santos (Tobit Raphael), the smart Asian kid with stern parents, Neha (Tiya Sircar), the only female in the group who is a fan-girl of all things sci-fi and anime, and Lyle (Josh Brener), the team leader who has worked for Google for four years and guides the team in the right direction, but lacks confidence. These actors play their parts perfectly and are fun to watch on screen, but with what they were given, their characters can only go so far. Meanwhile, Graham (Max Minghella) is the villain here who is a British student who is incapable of any type of friendship and seems to step on and belittle everyone he can. His over-the-top performance is annoying, but effective and will stop at nothing to defeat our team of misfits. Rose Byrne plays the love interest for Wilson, which doesn’t come easily, and Will Ferrell, Josh Gad, Rob Riggle, Aasif Mandvi, and Gary Anthony Williams all turn in small and forgettable cameos. Vaughn and Wilson do a great job of improving with one another and providing their same brand of humor from film to film. The script however limits their ability to really go the extra mile and break off into something different and original. Director Shawn Levy, whose biggest projects were the ‘Night at the Museum‘ films showcased Google perfectly. The rich primary colors constantly surrounding the building, with multi-story slides, nap pods, and comfy couches were very appeasing to the eye and almost seemed like a fairy tale. 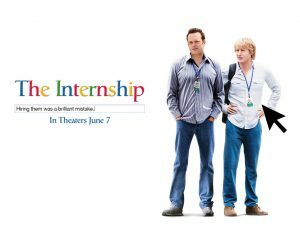 The story and message itself of ‘The Internship‘ is a solid one, but how this was all executed, ended up making this film not up for the long term job. There are no twists and turns you can’t see coming from ten miles away, and its comedy runs dry as we have seen it time and time again. Despite having a great cast who is capable of amazing comedy, that isn’t the only element you need to turn out a good movie. Save this flick for a rental as the only true remarkable part of it was the creative end credit sequence. ‘Fighting With My Family’ – Film Review! This entry was posted on Thursday, June 6th, 2013 at 2:33 pm	and is filed under Film, News. You can follow any responses to this entry through the RSS 2.0 feed. You can skip to the end and leave a response. Pinging is currently not allowed. « Film Review: Joss Whedon’s ‘Much Ado About Nothing’!! !